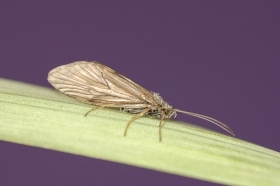 Sometimes known as the “Mother’s Day Caddis” the common Grannom is a very important hatch in the pre-runoff period in April and May on the Henry’s Fork, South Fork, and other local wateres. 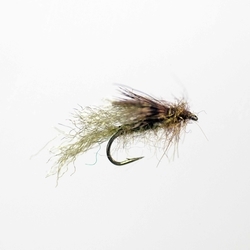 These caddis are second only to the Spotted Sedge in importance for fly-fishers. The case making larvae are a very important food source for wintering trout. Another species produces very good fishing on the Henry’s Fork, Madison, Yellowstone and other waters during late summer. April and May and August through early September. Emergence occurs in the afternoon and early evening. Egg laying frequently coincides with the emergence. All water types. Larvae build square cases. They thrive on gravel, rocks and aquatic vegetation. Pupae can drift long distances while struggling to escape the pupal shuck. Males are one size smaller than females. 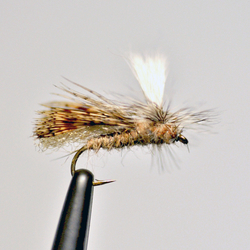 The emergence often produces explosive rises from trout that are hungry after a long winter. 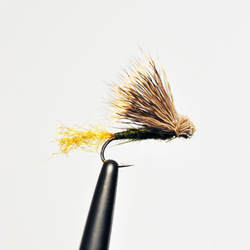 Best technique is to use a pupa as a dropper from a dry fly.